Photograph, Portrait of Decimus et Ultimus Barziza. Image available on the Internet and included in accordance with Title 17 U.S.C. Section 107. BARZIZA, DECIMUS ET ULTIMUS (1838–1882). Decimus et Ultimus Barziza, lawyer, politician, author, businessman, and officer in the Confederate Army, was born on September 4, 1838, in Virginia, the tenth and last son of Phillip Ignatius and Cecelia Amanda (Bellett) Barziza. He was the great-grandson of eighteenth-century English scholar John Paradise and a direct descendant of the Ludwells, who owned extensive property in colonial Virginia. In 1857, after graduating from William and Mary College, Barziza followed three of his brothers to Texas and studied law at Baylor University. He graduated in 1859, moved to Owensville, Robertson County, and set up his law practice. Photograph, Portrait of a young Decimus et Ultimus Barziza. Image available on the Internet and included in accordance with Title 17 U.S.C. Section 107. At the outbreak of the Civil War he volunteered for service in the Confederate Army and was soon elected first lieutenant in Company C of the Fourth Texas Infantry, which became part of Gen. John Bell Hood's famed Texas Brigade in Robert E. Lee's Army of Northern Virginia. Barziza was promoted to captain and led Company C into the battle of Gettysburg. During the attack on Little Round Top on July 2, 1863, he was wounded and left behind when the Confederate troops were forced to retreat. Although feigning death, he was discovered by Union troops and taken prisoner. After a year in federal hospitals and the prison camp at Johnson's Island, Ohio, he was part of a contingent of prisoners sent from Johnson's Island to Point Lookout, Maryland. On the journey he managed to escape by diving through the open window of a train, near Huntingdon, Pennsylvania. Cover of Barziza's published book, The Adventures of a Prisoner of War. Image available on the Internet and included in accordance with Title 17 U.S.C. Section 107. After his escape he made his way to Canada, where he was one of the first escapees to use a network set up by rebel agents and Canadians to send escaped Confederates back to the South via Nova Scotia and Bermuda. Barziza arrived at Wilmington, North Carolina, in April 1864, and was allowed to return to Texas to recover from the hardships of his escape. 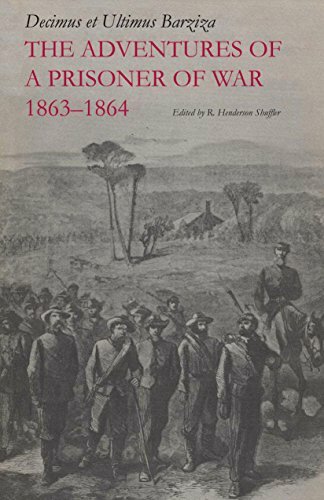 In February 1865 he published his war memoirs anonymously in Houston under the title The Adventures of a Prisoner of War, and Life and Scenes in Federal Prisons: Johnson's Island, Fort Delaware, and Point Lookout, by an Escaped Prisoner of Hood's Texas Brigade. Barziza settled in Houston, where he established a well-known law practice. He also became active in politics as a staunch Democratic opponent of Reconstruction. He joined other prominent Texans in calling for a "conservative state convention," which was held in the Harris County Courthouse on January 20, 1878. In July of that year he served on a statewide committee that organized the state Democratic convention at Bryan. He was instrumental in removing scalawag Governor Edmund J. Davis from office, and in 1873 Barziza was elected as a representative from Harris County to the Fourteenth Legislature. In 1875 he was reelected but subsequently lost the speakership of the House, by a vote of forty-five to forty-three, to Thomas R. Bonner of Smith County. Picture of the gravestone of Decimus et Ultimus Barziza. Courtesy of Find a Grave. Image available on the Internet and included in accordance with Title 17 U.S.C. Section 107. During the Fifteenth Legislature Barziza was part of a minority group that clashed with the House majority over a bill to give the Texas and Pacific Railway Company an extension of time for complying with the requirements for a land grant. The bill passed the Senate but could not get past the House before the session was scheduled to adjourn, at noon on July 31, 1876. Proponents of the bill lobbied for an extension of the session and managed to have the House recess until 3:30 p.m. on July 31. Barziza attempted to prevent the continuance of the session by absenting himself from his seat along with thirty-three other House members. However, the speaker ordered the missing members arrested and returned to their seats. In protest, Barziza, ill and in bed, tendered his resignation from the House, on August 2, 1876. He returned to Houston, where he continued his successful law practice and helped found the state's first trust company, the Houston Land and Trust Company, which he served as chairman of the board. Barziza married Patricia Nicholas of Buckingham County, Virginia, in March 1869. They had no children, but in July 1872 they adopted Barziza's orphaned nephew Phillip Dorsey Barziza. Decimus et Ultimus Barziza died after a lingering illness in his home at the corner of San Jacinto and Walnut streets in Houston, on January 30, 1882. R. Henderson Shuffler, "Decimus et Ultimus Barziza," Southwestern Historical Quarterly 66 (April 1963). R. Henderson Shuffler, "A Texas Profile: Decimus et Ultimus Barziza," Texas Bar Journal, April 22, 1963. R. Henderson Shuffler, ed., Decimus et Ultimus Barziza (Austin: University of Texas Press, 1964). Handbook of Texas Online, Jeffrey William Hunt, "BARZIZA, DECIMUS ET ULTIMUS," accessed April 21, 2019, http://www.tshaonline.org/handbook/online/articles/fba99.